Mission: To provide resources and experiences that inspire, inform, entertain, and connect members of the community throughout their lives. All are welcome to join the (Mostly) Fiction Book Group. This month’s book is nonfiction. Find out more here. Current title now available at the library! 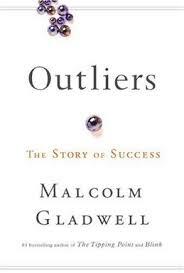 In his third nonfiction book, Malcolm Gladwell takes us on an intellectual journey through the world of “outliers”–the best and the brightest, the most famous and the most successful. He asks the question: what makes high-achievers different? Outliers is a landmark work that will simultaneously delight and illuminate. This entry was posted in Library Services. Bookmark the permalink. Visit the Trustees' website to view the meeting minutes and agendas.